Budget Maximising for your Landscaping Project! At Aura Landscapes, we don’t profess to be the cheapest, but we do profess to be the best; and our prices reflect the quality of our products, our people, our designs and our service. However, we do understand that our customers have a budget, and the amount of money they have for their landscaped garden is not endless. For this reason, we wanted to tell you a bit about how we help to manage your costs, without compromising on quality (which we would quite simply, never do!). At Aura Landscapes, our service extends to full planning and project management; from the very first time we talk to you, until the job is done. It is because of this, and the continued communications we have with our customers, that we are able to ensure we do not venture off track as far as budgets are concerned. Our plans are very tightly constructed, along with the budgeting, so you can rest assured that we will not spring hefty additional costs on you at the last minute! 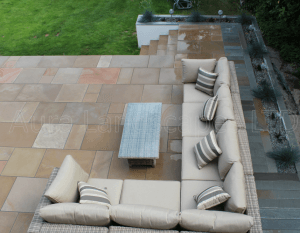 When understanding your requirements for a new garden, our skilled designers will always take into account exactly how you want to use your garden, so we are able to come up with a solution that is tailored to you. No two gardens are the same for us; they are as unique as our customers are. Should you fall in love with your design (very likely), but feel that the cost is slightly above where you want it to be, there are alternatives. Aura Landscapes can work with you to define how we can reduce costs, by reducing the scope of the project, or changing the materials we intend to use to another suitable alternative. There are options for you, and because we are experts, we can advise on this. We always ensure we select the right staff member for the task at hand. We would not expect you to pay the salary of a highly skilled landscape architect to do some of the preparatory groundwork. This helps to further control costs. We never compromise on quality, but we can help you to spend your budget wisely. Please get in contact if you would like more information! Get social with us! Click here to view our Facebook page.